I am sharing a clean and simple card today that I created and mass produced when I realized I didn't make enough cards throughout the year. I was short about 50. YIKES!!! Thankfully, my MISTI came in handy and made creating these a breeze. I am adding this card over at Christmas Card Challenges. Beautiful Kristie! I love that die! This is so gorgeous, Kristie! I just may have to CASE you! Merry Christmas to you and your family & friends! Beautiful card. Love the sentiment. May you have a Blessed and Merry Christmas. SO lovely Kristie! :) Beautiful! Beautiful! I adore this design! Hey Kristie, I absolutely adore your card!! I believe it's my favorite that I have seen so far!! I don't have that sentiment stamp but would it be okay if I case your card? It's beautiful!!! This is so pretty Kristie!! Gorgeous! love the wreath and the soft grey with the rich red! Merry Christmas, Kristie! Thanks for all your support and lovely comments through the year! Such a beautiful card. Love the colour you used for the wreath. Love your card, the Misti really does come in handy when you have several cards to make. 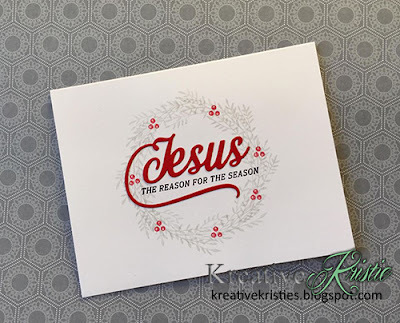 I love the sentiment and that die, I may have to hop over to Papertrey Ink and buy that! Thanks for playing along with the Christmas Card Challenges. This is just lovely! Thanks for playing along with us at CCC. Beautifully clean & simple! I love, love, love the soft grey wreath and the sentiment font!